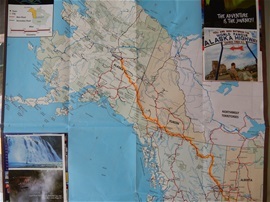 Para chegarmos ao Alaska, entramos no Canada por British Columbia, onde na cidade de Dawson Creek se encontra o início oficial - milha 0 - da ALCAN – Alaska-CANadian Highway – e possui o seu termino oficial na milha 1420 em Delta Junction – no Alaska. Muito embora também se considere como Alaska Highway todo o trajeto desde a cidade de Edmonton – Alberta – Canada ate a cidade de Fairbanks – no Alaska. O Presidente Herbert Hoover já havia considerado a ideia de uma ligação por terra entre os 48 estados continentais dos EUA com o Alaska desde 1930. No entanto, foi após o bombardeio ‘a Pearl Harbor em 1941 que a construção da estrada foi considerada uma necessidade militar como rota de suprimento e defesa da América do Norte contra os Japoneses. Oficialmente a construção da estrada se iniciou em 8 de marco de 1942 – com um grupo iniciando o trabalho ao norte em Dawson Creek, nesta época uma pequena cidade com 600 habitantes; e foi completada em tão somente 8 meses – em 25 de outubro de 1942!!! Mais de 11.000 tropas Americanas, incluindo 7 regimentos de engenheiros, 16.000 trabalhadores civis canadenses e americanos e 7.000 pecas de equipamento foram utilizados nesta tarefa Herculeana de penetrar as 15.000 milhas de montanhas, lodo e mosquitos. A rota geral da estrada seguia as trilhas previamente existentes e campos de aviação desde Edmonton – Alberta ate Fairbanks – no Alaska. Uma viajem que propicia vistas indescritíveis da natureza e locais históricos e de interesse ao longo do caminho!!! The Alaska Highway, formerly known as the ALCAN (Alaska-Canadian) Highway winds its way through wilderness connecting Dawson Creek, British Columbia and Fairbanks, Alaska. To get to Alaska we entered Canada through British Columbia and travelled along the Alaska Hwy – that has its “mile 0” in Dawson Creek and officially ends on “mile 1420” at Delta Junction – Alaska. But some also consider it starting in Edmonton – Alberta and finishing in Fairbanks, AK. President Herbert Hoover considered an overland link from the lower 48 to Alaska as early as 1930. However, it was not until the bombing of Pearl harbor in 1941 that construction of the highway was deemed a military necessity as a supply road to defend North America against the Japanese. President Roosevelt authorized construction of the Alaska Highway on February 11, 1942. The U.S. secured rights of way through Canada in March. The formal agreement between the two countries stipulated that the US pay for the construction and turn over the Canadian portion of the highway to the Canadian Government after the war ended. In turn, Canada furnished the right of way, waived import duties, sales tax, income tax and immigration regulations; and provided construction materials along the route. More than 11.000 American troops, including 7 regiments of engineers, 16,000 civilian workmen from Canada and the US and 7,000 pieces of equipment were thrown into the herculean task of penetrating 1500 miles of mountains, muskeg and mosquitoes. The general route of the highway was along a line of existing trails and airfields from Edmonton, Alberta to Fairbanks, Alaska. This chain of airfields was known as the Northwest Staging Route. On September 24, 1942, soldiers met at Contact Creek – near the British Columbia Yukon border marking the completion of the southern sector. The road was literally bulldozed through the wilderness. Road conditions of the ALCAN were horrific with 90-degree turns and 25 percent grades. Then on a cold November 20, 1942, 250 soldiers. Civilians and the Royal Canadian Mounted Police watched as officials from the United States and Canada cut the ribbon to officially open this major road link. The ceremony took place at “mile 1061”, known as the “Soldiers Summit”. The highway was officially opened to the public in 1948. A monumental achievement even by today’s standards, the Alaska Hwy was literally carved out of the wilderness in only 8 months at a cost of $ 140 million dollars. It is renowned as one of the most scenic drives in the world!!! It offers stunning scenery, historic towns and places, unlimited fishing, hiking and outdoor enjoyment along the way.